Two significant things happened at Italia 90 that would change English, and – arguably – world football into the cultural monolith that it has become today. The first was that it was boring. 0-0 draws clogged the world’s wall charts as a functional Germany claimed the title and a petty, cynical Argentina reached the final. The Italian hosts defeated themselves in the semi, reverting to defensive type after impressing us all with some Baggio inspired bursts en route. It was the other defeated semi-finalist, England, that provided the second significant catalyst for change – Gazza. Football was at a crossroads. Was it a vehicle for victory or entertainment? It had provided a shallow victory and no depth of entertainment at its global showpiece. Meanwhile, a certain Australian/American/walking-conspiracy-theory/media mogul clocked that despite some of the drabness on display, 30m UK viewers that had watched a teary Gazza lose to Germany and came up with a business plan for his flagging experiment in satellite television. 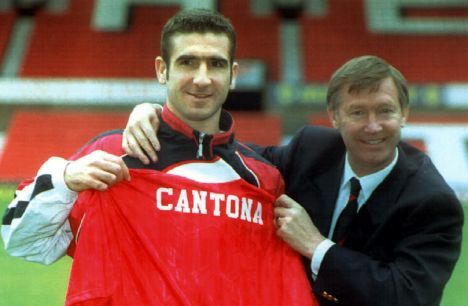 The sea change that still shapes football globally began in earnest twenty years today when Eric Cantona joined Manchester United from Leeds United for a paltry £1.2m. Football would now become a vehicle for entertainment and mind-boggling profits. Gazza was St John the Baptist (yes that is what have you just read) and English football’s messiah turned out to be French. Pop Lifer will not bore you with reams of Cantana footage (though that chip against Sunderland and the celebration that followed always works for us). He had more charisma than talent (he was consistently poor in Europe and the likes of Weah, Zidane and Baggio were far, far, better players) but what he has come to represent is more significant. The Manchester United side he led played a brand of gung-ho, all out attacking football that conquered the Premier League. And as a result, the Premier League conquered the world. The business model of the Premier League is distasteful, corrupting and anti-competitive but the type of football it produces is ridiculously and persistently entertaining. Across the world, people with power noticed. Trophies are an alchemy of luck and talent. Profit is the product of planning. And profit could be yielded not by encouraging 0-0 draws but 4-3 victories. Football changed and since then every major club and every major football culture has concentrated not on avoiding defeat but winning matches, on entertaining. And as well as being a garish amoral marketing circus, football today is magnificent fun. Two words: Lionel Messi. This blog marks the moment when that change became real. However, though Cantona became the icon, the real credit for this change unfortunately rests with two men it is impossible to like but easier to respect – Sir Alex Ferguson and Arsene Wenger. Rupert Murdoch bought English football but these two changed it. They harnessed the increasing strengths and fitness of players not to stop teams but to beat them and in so doing ensured that Murdoch’s purchase would yield far more than he could have possibly imagined. It also led to Mark Lawrenson wearing tight shirts on prime time Saturday night TV so a certain perspective is required. This entry was posted in Picture This, Sport, Uncategorized and tagged Arsene Wenger, Eric Cantona. Alex Ferguson, Gazza. Bookmark the permalink. I can’t, for the life of me, believe this was 20 years ago. No. A few years later I had a fairly large blank space on a wall and I had one photo hung on it. It was a photo of Cantona from a magazine (maybe The Face?) so about A4 in size.